It seems that Samsung is very keen on its recent trend to use faux leather and stitch finish in the exterior of its devices. The first ones to hop on that bandwagon were the Galaxy Note 3 and the Galaxy Note 10.1 (2014 Edition). The hate-it-or-love-it pseudo-leather back cover also made it to a whole set of other devices such as the Galaxy Grand 2 and the Galaxy S4 Black Edition. Samsung apparently liked the faux leather design so much that it even put it on some of its laptops. And now, even some of the company's accessories follow the fashion. Meet the EB-PG900B – a Samsung-branded external battery pack that comes with... yes, you got it right - faux leather and stitch finish! The accessory has a capacity of 6,000mAh, which should be more than enough to fully charge any smartphone and partially bring a tablet back from the dead. Samsung's battery pack sports an LED indicator and a retracting microUSB cable. The whole shebang has dimensions of 5.51 x 2.93 x 0.43 inches and tips the scales at 6.1 oz (173gr), which means that its overall size is pretty similar to the one of a, say, Galaxy S5. If you like Sammy's latest faux leather design trends and you are in the market for an external battery pack, then the EB-PG900B could be just the thing for you. 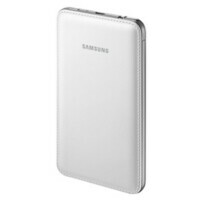 The battery pack is currently available only in India – it comes in white and its price is no more or less than $60 (Rs. 3,599). Hopefully, Samsung's faux leather power bank will eventually make it to other markets across the globe in the near future. totally agree over the leather thing..
and plastic is more dangerous to the environment than the metal. You will only hear that on tech websites where many people hate Samsung just for fun. The fake leather actually looks good and feels good. I havnt seen any professional reviews that talks negative about the note 3 fake leather back. There are people who think that dead animals' skin is better than faux leather( even if it looks just like original leather)....typical Samsung haters ask for aluminum which is okay because that would make the devices look better...original leather doesn't. I had a leather cover for my iPad and it got pretty frickin' disgusting from the hand oil over the course of a month. I'll never get leather again for anything that comes into contact with my skin on a regular basis, that's for damn sure. we are not discussing about the meaning of the word 'faux', no one is telling that faux leather is original leather, I am telling why using 'faux' leather is better than using original leather. I'd imagine if this was bundled with a flagship without a dramatic climb in price, it'd be phone of the year. I have a 6000mah rock, sold for 30, this could be easily packaged with a phone. lol... whenever Samsung comes up with a design that sells a lot, they squeeze every bit of profit out of it, think GS3 and Note 3 ... I hope we wouldn't find a 4K tv with faux leather... but really the battery looks amazing here ..
That's the sexiest powerbank I've ever seen. Don't like power bank in general. I buy phone with removable battery only.